Southern California salad lovers should check their refrigerators, with Fresh Express announcing Wednesday that it was recalling selected romaine lettuce products due to the possibility of E. coli contamination. The affected romaine products have "use-by" dates of July 9-12 and have an "S" in the product code. According to the company, the products have been taken off store shelves, but consumers could have some in their refrigerators. 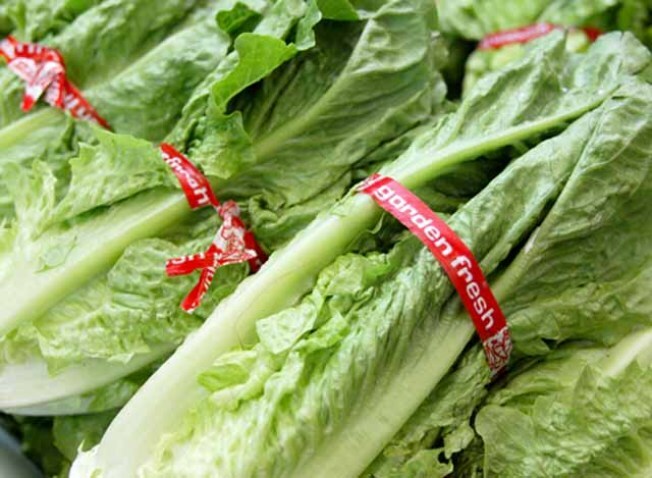 According to Salinas-based Fresh Express, the recall was announced in response to a positive E. coli reading in a package of Hearts of Romaine salad during a random sampling test conducted on behalf of the U.S. Food and Drug Administration. In addition to California, the affected salad products were also distributed in Arizona, Arkansas, Colorado, Hawaii, Idaho, Kansas, Minnesota, Montana, Nebraska, New Mexico, North Dakota, Oklahoma, Oregon, South Dakota, Texas, Utah, Wyoming, Washington and Nevada. Anyone with questions can contact the Fresh Express Consumer Response Center at 800-242-5472.